While you could argue that your laptop is pretty mobile, mobile casinos are those that are accessible from mobile phones, smartphones, iPhones, iPads, tablets, etc. The games are optimized for portable devices, so you can play mobile casino games on your Blackberry, Nokia, Samsung, and Apple products. It’s hard to remember a time when you could only play casino games in an actual brick-and-mortar casino. 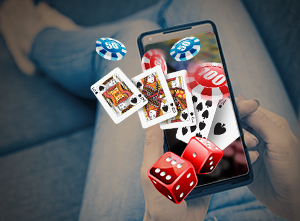 Since the dawn of the internet, however, online gambling has taken a leap and has refused to look back; the games have gotten flashier, more entertaining, and now, with the explosion of the online mobile casino market, a lot more accessible. Mobile casinos, like the rest of the mobile universe, allow you to play absolutely anywhere. Play online mobile slots on the train. Grab a quick game of mobile roulette while you’re waiting in line for your lunch. You can even play mobile blackjack while you backpack through the wilderness, assuming you have a signal and aren’t worried about bears. While nearly everything—from the smooth play to high-definition graphics and SSL digital encryption—runs exactly like their online counterparts, the beauty of online mobile casinos is in their accessibility. Unless otherwise indicated in our mobile online casino reviews below, you can expect the same access to VIP Clubs and loyalty points as you would if you were playing at the online casino. Right now, mobile technology is the primary platform for entertainment. We’ve listed a variety of the best online mobile casino gaming options below. Good luck, and may boredom be forever conquered. We’re constantly updating our list of online mobile casinos as well as our online mobile casino reviews. Please check back often to get the latest additions! Mobile Casino Devices & Articles on Mobile Casinos. PLUS 100 free spins on Achilles! Accounts from the following countries, will be exempt from bonus redemption upon creation of an account: Albania, Bosnia and Herzegovina, Bulgaria, Croatia, Greece, Macedonia, Mauritius, Montenegro, Netherlands, Poland, Romania, Russia, Serbia, Sweden and United Kingdom. Minimum Deposit: $25. Games: All Slots & Keno. 100% up to $400 on your first 5 deposits. Your maximum withdrawal is set to 30x the amount of the qualifying deposit (Remember, bonus amount is Non-Withdrawable). In the interests of fair gaming, all bonus promotions are limited on the maximum bet allowed to be place during the playthrough. $/€ 10 is the maximum bet amount on any promotion unless SPECIFICALLY stated otherwise. Betting above $/€10 during a bonus playthrough will result in promotion winnings being voided. New Customer Offer. T&C’s Apply. 18+.Redeem the Bonus Code EXTREME (6 x per account) (Remember to first redeem the code and only then deposit. Your maximum withdrawal is set to 30x the amount of the qualifying deposit. Games that are excluded: Casino Battle, Craps, American roulette, European roulette and Baccarat. Redeem it 5 times. Minimum deposit $20. For USA players Deposits can be made in USD, but playable balance will be in AUD. Players from the following countries do not qualify for the free no deposit bonus: Albania, Armenia, Azerbaijan, Belarus, Bosnia and Herzegovina, Bulgaria, Croatia, Hungary, Indonesia, Kazakhstan, Kyrgyzstan, Latvia, Lithuania, Mauritius, Macedonia, Malaysia, Moldova, Montenegro, Poland, Romania, Russia, Slovakia, Slovenia, Tajikistan, Turkmenistan, United Kingdom, Ukraine, Uzbekistan. PLUS 50 Free Spins. Unless otherwise mentioned or a special confirmation from support via chat or email, players from the following countries are restricted from the promotion: Albania, Bulgaria, Cyprus, Croatia, Lithuania, Latvia, Macedonia, Romania, Ukraine, Slovenia, Slovakia, Serbia. Until the play through requirements have been met, the maximum bet that can be placed is €$5 or 0.025 BTC. The following slot games do not contribute towards the completion of the wagering requirement of a bonus: Pocket Dice, Eggomatic, Big Bang, The Dark Knight, Peek-A-Boo, Tomb Raider, The Dark Knight Rises, The Wish Master, Immortal Romance, Aliens, Mega Moolah, Dead or Alive, Forsaken Kingdom, Dr. Jekyll & Mr. Hyde, Ragnarok, Scrooge, Ninja and Castle Builder. Demolition Squad, Steam Tower, Reel Rush, Reel Rush touch, Muse: Wild Inspiration, Victorious, Bloodsuckers, Bloodsuckers touch, Kings of Chicago, Simsalabim, Zombies, Jack Hammer 2, Jack Hammer 2 touch, Victorious touch, Ghost Pirates, Johnny the Octopus and Mega Gems contribute at a 50% rate. Jackpot 6000, Mega Joker, Gypsy Rose and Safari contribute at a 75% rate. New Customer Offer. T&C’s Apply. 18+. Deposit between $10-$250.